One of the FIRST things I learned to do with my new Instant Pot pressure cooker was to make yogurt. Don't get me wrong, I still love and use my Cuisinart pressure cooker, but it doesn't make yogurt! There are SO many ways to make yogurt: yogurt maker, slow cooker, convection oven, heating pad, etc. There are several pressure cookers that have a Yogurt function. GoWise , Instant Pot Duo, and the Instant Pot Smart are just a few that I have heard people use to make yogurt. 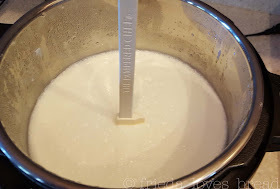 So, if you have a yogurt maker or a pressure cooker with a yogurt function, let's get started! UPDATE! I now have a complete Instant Pot Yogurt for Newbies Reference Guide! This includes every. single. thing. you would ever want to know about yogurt! I spent several months helping answer many, many questions, and now I have all the answers in one place, at your fingertips! Bookmark this page and refer to it with any questions you have. Enjoy! 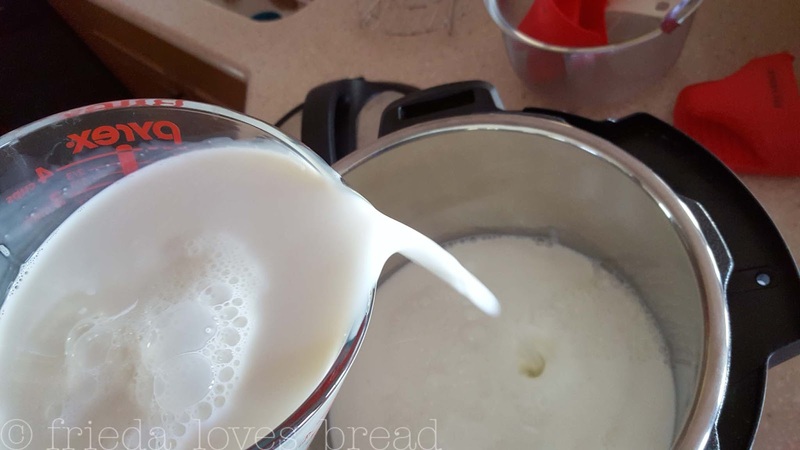 If you want an even easier method for making yogurt that has fewer steps (pour milk/add starter/push yogurt button) you may want to check out this Cold Start Method that uses ultra pasteurized milks, like Fairlife milk. Here's a video that I did that shows YOU how easy it is from start to finish! First, it is handy to have an digital thermometer. I currently have the LavaTools Javelin Digital thermometer and and a Thermapen digital thermometers. They both work accurately and read temps within 3-4 seconds.. I use this to measure the temps of all my cooked meats and check the temp of my yogurt. You can use any thermometer you have, as long as it is accurate and reads the temps of 90°F-190°F. There are 2 temperatures important to making yogurt and it is helpful to know and measure with an accurate thermometer to ensure a successful batch of yogurt. Next, find some yogurt. Yes, it takes yogurt to make yogurt! You can use any brand, or style of yogurt, just look for one that says CONTAINS LIVE AND ACTIVE CULTURES. *made with live/active cultures will NOT work. Your yogurt needs to say "contains" or list LIVE cultures in the ingredients. - Fat content doesn't matter. - Sugar content DOES matter. If you are using a flavored yogurt, look for one that has 9 grams of sugar or less per serving. Excess sugar can inhibit or slow down the culturing process. - Make sure it is FRESHLY OPENED - once opened, the active cultures will die in less than 7 days, even though your yogurt is still good to eat. Here is a list of companies that have yogurt with live cultures. I'm using Good Value Greek Yogurt from Walmart. It comes in a small 4 pack and has been working well for my yogurt. Fresh yogurt works best! You don't have to purchase yogurt from the store. You can also get freeze dried starters online or after your first batch, reserve a few Tablespoons for your next yogurt. You can reserve some yogurt from your own yogurt as a starter, but it only lasts 5-6 generations. Some people make a batch of yogurt and freeze it in ice cube trays or silicone cups and let it thaw before using. Milk. I have made yogurt using Whole, 2%, and 1% cow's milk from the store. I have found that the final yogurt yields more and is creamier with whole milk. I still get great results with 2% and prefer it over 1% or skim. You can use skim and low fat milks; the yield will be less if you strain it. You can use raw milk - it may be a little thinner than pasteurized milk, but it will work. For your first time making yogurt, you will want to avoid using ultra pasteurized milk. Ultra pasteurized milks are heated to 280° for a few seconds, killing 99.9% of the bacteria in the milk, rendering it too sterile to culture yogurt properly. Organic milks are often ultra pasteurized. If all you can find are ultra pasteurized milk in your area, start with a half gallon and see if it works for you. Some ultra pasteurized milks work, some don't. It's hit and miss for making yogurt. Once you have made a successful yogurt with regular, pasteurized milk and are familiar with the process, try your favorite organic or ultra pasteurized milk and see if it works. Lactose free milk can be used. Lactaid and Fairlife milks have been used with success. If you are highly lactose intolerant, you may want to try one of these milks. 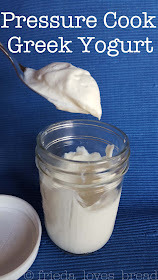 If you are lactose intolerant, but can tolerate Greek style yogurt, you will want to strain your yogurt. Straining the yogurt removes much of the lactose along with the whey. Another option is to incubate your yogurt for 15 or more hours, in which all the lactose is consumed by the cultures and result in a tangy, lactose free yogurt. If you cannot have dairy or wish to make a Vegan yogurt, by all means you can! Folks have used Coconut Milk, Soy, Almond Milk, and others. Plant based milks need a thickening agent to help make yogurt, so an additional ingredient is needed. This is a traditional heat/cool/add starter and incubate method. If you want a simple, no heat, no temp taking, dump and start method of using Fairlife milk to make yogurt, check here! This cold start method is only for UHT/UP milks. (Some UP milks work, some don't. Fairlife milk has worked). I like to start my yogurt about 45 minutes before I go to bed. This includes the heat up time, cool down time and stirring in the yogurt starter. 1. Set aside 1 Tablespoon of yogurt into a small bowl. Make sure all your tools, and equipment are clean and ready to use. Use a clean liner, free of any soap residue. **If your liner/pot are warm from previously cooked food, make sure you use a COLD liner and Pot. 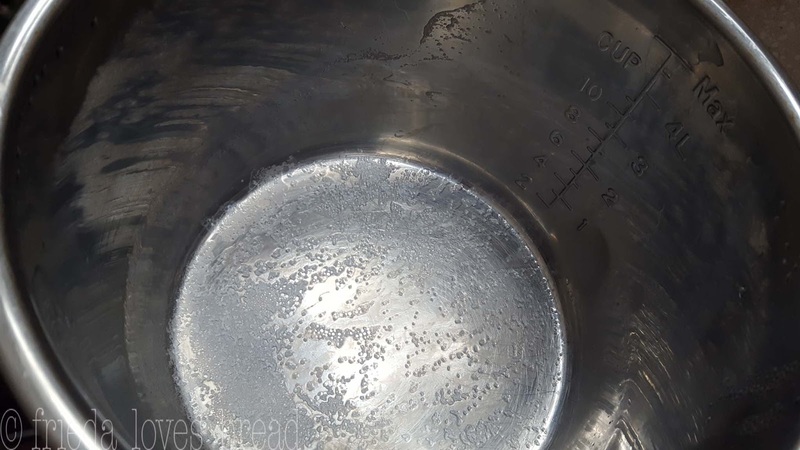 If it's still warm, the heat sensor at the bottom of your pressure cooker will not register the temp of your milk correctly and it will be more difficult to reach the temp on one boil cycle. 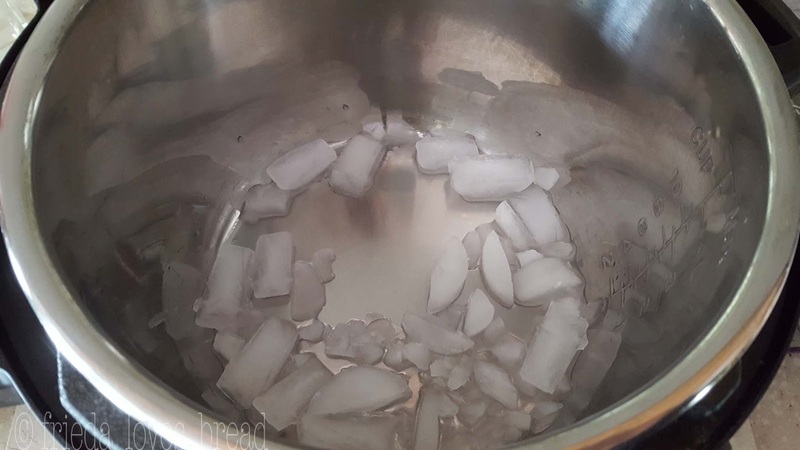 TIP: Put some ice cubes in your pot and let it sit for a few minutes. Dump the ice water out, but do not dry the pot. This tip also helps keep the cooked milk from sticking to the bottom of your pot! I poured out the heated milk just to show you how little milk solids are cooked onto the pot. It really works! 2. Pour 8 cups (half gallon) of milk into the pressure cooker. I have made a full gallon before, but it is easier to make/strain smaller batches and it doesn't take as long to heat up or cool down. 3. Move the pressure valve to the SEALING setting. Make sure your sealing ring is in! If you are worried about a smelly ring transfer, you can use a glass lid from your pots or even a glass pie plate lid for the entire process. 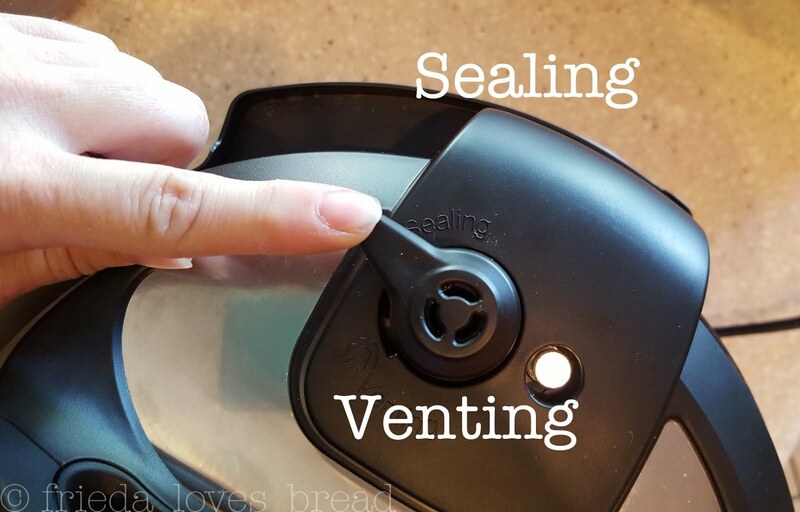 I use a separate sealing ring for yogurt/cheesecakes/rice. 4. Duo & Smart Models: Push YOGURT and quickly push ADJUST. At first, your screen will read 8:00, but if you push ADJUST within 5 seconds, it should say BOIL. **If you accidentally push ADJUST twice, your screen will say 24:00 you will get a lower temp that will not work for your yogurt. Push Keep Warm/Cancel and repeat step 4, till you see the words BOIL and MORE on the display. Push START and the milk will heat. In 10 seconds, heating will begin. 2. Touch the Temperature field repeatedly to toggle between Boil, Yogurt, and Custom. Half gallon will take about 25 minutes to reach 180°F or higher. Full gallon of milk will need whisking every 10 minutes and take 50 min to reach 180°F. This is where you test it with the thermometer. If it doesn't reach 180°F, you will be fine. 180°F is only if you want a custard style yogurt. You can still make a great yogurt without reaching this temp. Bring your milk out 30 minutes before starting. Start with a cold pot - put some ice cubes in to cool it quickly. Whisk every 10 minutes during the boil cycle. Use a well fitting glass lid or the IP lid/seal/vent closed. After following the above tips, you can carefully use the Saute LOW setting, while constantly whisking your milk, till it reaches 180°F. Do you REALLY need to heat your yogurt? First, heating the milk will kill any wild bacteria you may find, especially if you are using raw milk. These bacteria can compete with your yogurt loving strains of bacteria and affect your final outcome. Second, whey, an abundant protein in milk, is fully denatured at 180°F and results in a firmer, thicker, custard style yogurt. So, if your milk is pasteurized and you like a thin set yogurt, by all means, skip the initial heating step. You can still skip this boil step and strain your yogurt for a silky texture. 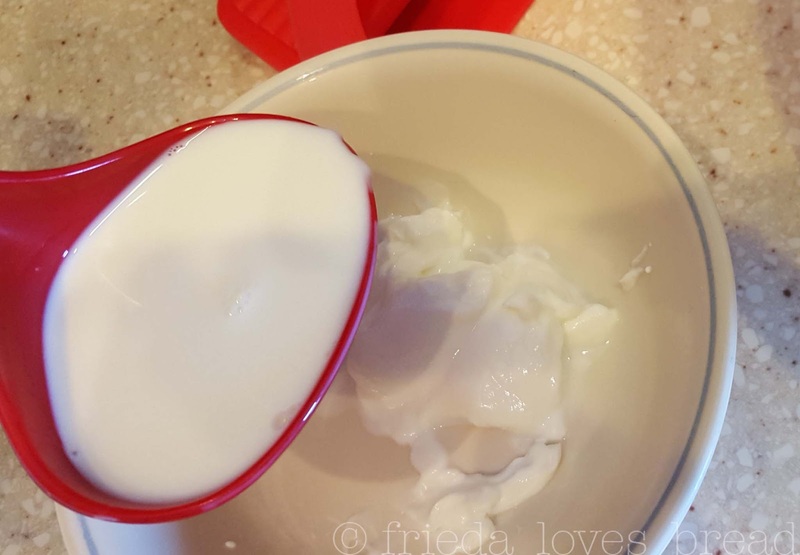 If you don't want to go through the steps of heating your milk, cooling, taking the temp, you may want to try the Fairlife milk Cold Start method of making yogurt. 5. Next, bring your heated milk down to a reasonable 110°F. This temperature, is important. Too hot, and it will kill your yogurt starter. Too cold, and your starter won't work quickly enough to outrun the bacteria that can spoil your milk. If your milk temp drops below 90°F, warm it back up to 110°F. It is fine to add your starter in the 90°F-110°F range. Scrape off any "skin" from the top if you want a smooth yogurt. You can let it sit at room temp for awhile to naturally (takes an hour for a gallon of milk) bring down the temperature, but I prefer to set the liner of heated milk in a larger bowl filled with ice water. You can use your sink filled with cool water or gel ice packs to help cool your milk quickly. The rapid cool down method does not harm your yogurt in any way. RAPID COOL DOWN: Takes only 5 minutes for a half gallon of milk, 10 minutes for a full gallon. Stir gently and constantly, WITHOUT SCRAPING THE BOTTOM, until the temperature hits the "zone" of 110°F. There are cooked milk solids on the bottom of your pot and you don't want little bits of cooked milk in your creamy, smooth yogurt. Stirring while it is cooling will prevent "hot spots" in your milk and give you a more accurate temperature. Use an ICE WATER bath to quickly bring the temperature down. Remove the liner from ice water and wipe the outside of the liner with a clean kitchen towel. 6. Take some cooled down milk and stir it into your 1 Tablespoon of yogurt starter. Mix till smooth. Pour the warmed up starter back into the pot and give it a quick whisk. Don't scrape the bottom. 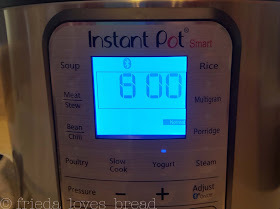 Put the liner into the Instant Pot. This is the display you want to see to make successful yogurt. 8:00 and the word NORMAL. 7. Duo & Smart Models: Push the YOGURT button. It will say 8:00, and NORMAL meaning your yogurt will incubate for 8 hours. Your yogurt will begin to set around hours 5-6 and will be mild. If you want a "tangier" yogurt, you can push the (+) button and increase your time to 10 hours or longer.....8 hours is a good place to start. That's it! Go to bed. Say "Good night" to your yogurt. ** If your IP keeps going back to the BOIL cycle, it has a memory of your last setting. Keep pushing the adjust button till you see 8:00 and normal on your display. The Adjust button will toggle between the MORE/NORMAL/LESS settings and the BOIL/8:00/24:00. Stop when you see 8:00 and NORMAL. When cycle has ended, the display will show YOGT. 2. Touch the temperature field repeatedly to toggle between Boil, Yogurt, Custom. 5. Touch Start to begin. If you stir it, the yogurt will get thin. Why? Whey. There is liquid whey, floating around in the yogurt and when stirred, it will get thin. Not soupy, but thin - more like a traditional style yogurt. 8. If you want to have a THICK Greek Style yogurt, you will need to strain it. 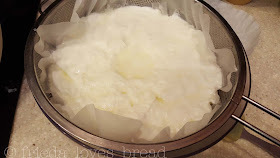 *If you use cheesecloth, you will need to use several layers of cheesecloth OR to put your pot of yogurt into the fridge to chill completely for 4-6 hours. This "sets" the yogurt and won't run through the cheesecloth. It will take longer to strain chilled yogurt - about 6-8 hours. heavy duty paper towels - don't use cheap ones, they'll tear and shred. Bounty is a good one. I like to use large coffee filters because they don't let ANY milk solids through. I can strain right away without chilling first. *If you don't want a super thick yogurt, put your liner in the fridge and let chill completely. I like to use coffee filters as I have a bunch ... er.... hundreds of them on hand. Use and dispose. Easy. I line my IKEA strainer with coffee filters and set it in my OXO Salad spinner bowl. Works like a charm. This is why I only use 1/2 gallon of milk at a time. I don't have a larger strainer or larger bowl and it's hard to divide a whole gallon's worth of yogurt into two strainers. *If you want to strain a gallon of yogurt, these Commercial Coffee Filters will be perfect with this 5 quart stainless steel strainer! Cover your yogurt with plastic wrap or a large dinner plate and immediately strain for 2-3 hours in the fridge. 4 hours will give me a cream cheese like texture. I end up with approximately 4-5 cups of thick, creamy yogurt and about 4 cups of whey. If you feel that your yogurt is too thick, you can always add some whey back in. Don't throw out the whey! I like to freeze my whey to use as STARTERS for my yogurt. Yes, it contains the same live cultures that your yogurt has - FREEZE RIGHT AWAY for best results. 9. Whisk your yogurt smooth and flavor your yogurt. Now is the time to sweeten or flavor your yogurt. Take a taste. You may enjoy it plain, with some fruit. I like to set aside some thick yogurt to use as STARTERS for my next batch - freeze right away in tablespoon portions in an ice cube tray. They will last up to 6 months! Bring out the cube at the beginning of the boil cycle at room temp and it will be thawed enough to mash when your milk has cooled. Take some thick unflavored yogurt to use as a mayo or sour cream sub. Works great in sandwiches, or other recipes. To the rest of my yogurt, I like to put 1/4 cup granulated sugar (or 2-4 tablespoons of warmed honey) and 1 teaspoon vanilla extract and whisk it smooth before scooping it into individual jelly canning jars. You can use any sweetener you like, honey, Stevia, Truvia, etc. I like to use my 8 oz. jelly canning jars to store 5 oz of yogurt in each one. Weighing with a scale ensures that each of my boys have the same amount and no fighting over the "largest one." I found the plastic reusable lids at Walmart. You can also find them on Amazon or at Target in the canning section. Having a "space" above the yogurt lets my family choose any toppings, mix-ins or flavorings of their choice. Honey, brown sugar, granola, berries, etc. My mom likes to sprinkle a little bit of Lemon Crystal Light drink mix into hers. Whey protein powder, chocolate syrup and chocolate drink mix powders are also favorites. Experiment and have fun with different flavors! Yogurt making is simple and you will be easily making it weekly for your family. Greek Style yogurt is simply strained yogurt that is thick and high in protein. If you want a more traditional consistency, you can skip the straining step and chill your yogurt in the fridge. Homemade yogurt has such a clean taste and the flavoring options are only limited to your imagination! If this is your first time making yogurt, start with the smaller, half gallon batch. Make sure your yogurt is very fresh, and opened just before starting your yogurt. 1. Set out 1-2 Tablespoons of plain yogurt in a small bowl. Set aside. OPTIONAL: Put several ice cubes into the Instant Pot liner. 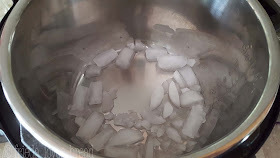 Let the ice sit for a few minutes; swish to coat the bottom of the pot, and dump out the ice/water. Do not wipe the pot dry. 2. Pour your milk into the Instant Pot liner. Cover, set vent to Sealing. You can choose to use a glass lid or lid from your pots, pie plate, dinner plate or a flat silicone suction lid for the entire process.3. Select the Yogurt More/Boil setting, according to your model. Check my post for directions. If you have the Ultra, HIGH is the setting you need. Cycle will take 20-25 minutes for a half gallon; 50 minutes for a full gallon of milk.4. 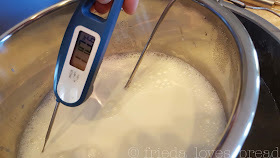 At the end of the boil cycle, whisk the milk and take the temperature with a thermometer. It should read 180°F or higher. If there is a "skin' on top of the milk, carefully remove it with the whisk.5. Remove the pot of hot milk and set it over the bowl of ice water. Every couple of minutes, stir the milk gently with a whisk, being careful not to scrape the bottom of the pot. Take the temperature until the milk reaches 100°-110°F. Remove the pot from the ice water. Wipe the outside of the pot dry and place it into the Instant Pot. 6. Ladle 1 cup of the cooled milk into a small bowl. Stir your room temperature yogurt until completely dissolved. 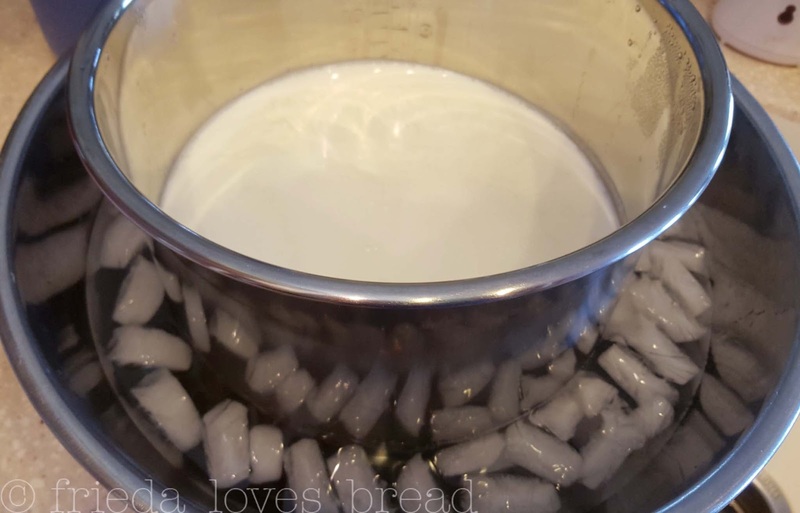 Pour this mixture into the pot of milk in the Instant Pot.7. Cover, close the pressure valve (Sealing) or use alternate lid as described above. 8. 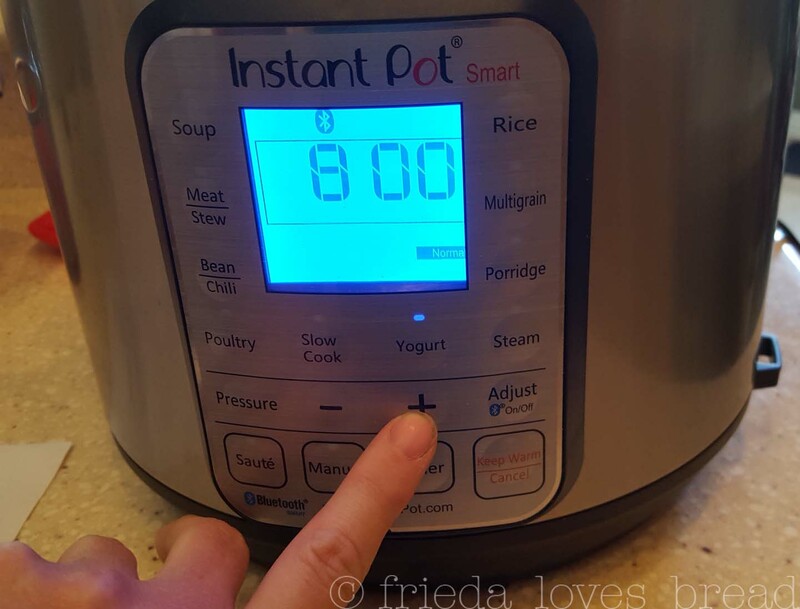 Incubate your yogurt, selecting the Yogurt Normal setting as per Instant Pot model. For the Ultra, Medium is the setting you need.9. Incubation Time: Yogurt setting automatically defaults to 8 hours. You can use the +/- buttons to increase/decrease the time. You can incubate for as little at 5-6 hours (mild yogurt) or as long as 24 hours (very tart yogurt). 8-10 hours is the average incubation time. Display Timer will count UP.10. 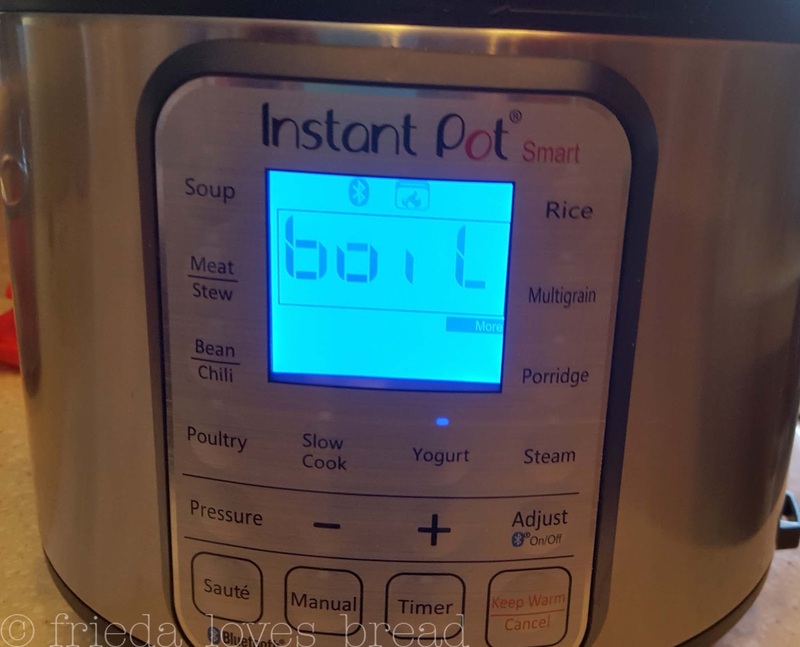 When the incubation cycle finishes, your Instant Pot will beep and display YOGT. Your yogurt should look set, like a soft Jello. You can immediately pour your warm yogurt into your lined strainer, set over a larger bowl to catch the whey, cover and put in the fridge for 4-6 hours. Larger batches of yogurt will take 8-10 hours to fully chill. If your yogurt is too thick, you can whisk some whey back in, a little bit at a time, until you reach your desired consistency.Flavor: Add 1 teaspoon of vanilla extract and 2-4 Tablespoons of warmed honey or granulated sugar. Refer to my IP Yogurt Guide for Newbies for many other flavoring ideas!Store your yogurt in a glass or plastic container, with a well fitting lid. Yogurt will keep for at least 2 weeks.Whey: clear whey will keep in the fridge for up to 6 months.Unsweetened yogurt & whey can be frozen to use as starters for future batches of yogurt. Freeze in tablespoon portions right after chilling/straining your yogurt. When frozen, they will keep viable in the freezer for up to 6 months. Thanks for the clear instructions that have led to many delicious batches of yogurt! I have heard people mention adding flavored creamer or sweetened condensed milk to a batch. Would I do this before heating? While adding the starter? Or when the batch is complete? I'm using the boil method because I have no yogurt button. Thank you!